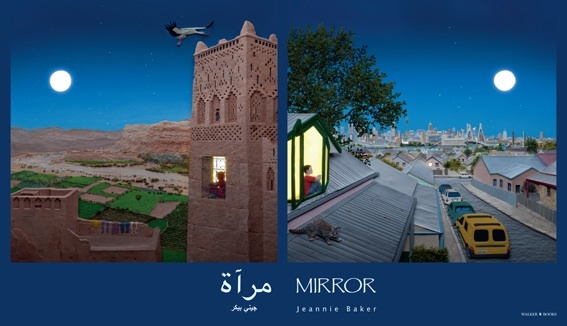 In her new book, “Mirror”, Jeannie celebrates the differences that makes up the diversity of world cultures and the elements that unite us, the bonds of family and the mundanities of every day life. Even the presentation, as two books united within one cover, highlights ‘same and different’, but highlights it in a way that draws us closer to both families, the traditional Moroccan family and the modern Australian family. Turning pages of each book simultaneously, reveals parallel aspects of the daily lives of these very different families. We see them with the intimacy and immediacy of a fly on the wall. They are at work, at meals, settling for the night, shopping and sharing. The colours are luminous and the details absorptive. Words are superfluous! I have always been a fan of Jeannie Baker’s beautiful, evocative, detailed collages. This latest book is a treasure! “Mirror” by Jeannie Baker, Walker Books, ISBN 978-1-4063-0914-0.